Our SiamTeas Signature porcelain tea cup is a combination of Japanese and Chinese design elements. 100% handmade by a specialized tea pottery master according to SiamTeas specifications, the tea cup leaves nothing to wish for either functionally or aesthetically. The generously dimensioned wall thickness of the elegantly outward-curved tea cup ensures high breaking strength and optimal cooling effect. For more information and illustration, please refer to the detailed product description below. Our SiamTeas Signature Shiboridashi is made of fine, light yellow clay and is unglazed. At this, the particularly iron-rich clay contributes to a set of desirable properties, including the high fracture strength of this clay vessel. At the same time, the functional and aesthetic properties of our shiboridashi, 100% handcrafted by a pertinently specialized tea pottery master and according to SiamTeas specifications, leave nothing to wish for. 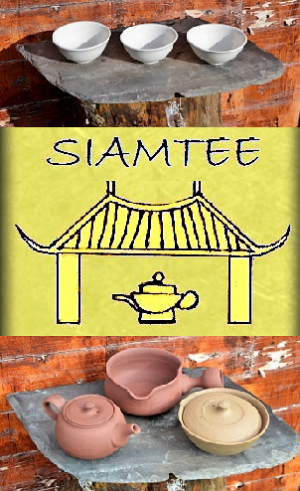 As the 3 core elements of the SiamTeas Signature Tea Ceramics line are children of the same creative and functional spirit, they make a perfect ensemble. So, we’d like to offer them as such, and, of course, with a price advantage! Buying the SiamTeas Signature Yixing teapot, Shiboridashi and Yuzamashi through the ensemble offer saves you roughly 20, – Euro, compared to the sum of the individual prices. For further information and illustrations, please see the product description below. The SiamTeas Signature Yixing Teapot – unglazed 200ml teapot in the classic Chinese Yixing style. The teapot is made of a fine red clay, particularly rich in iron, which gives it some particularly desirable properties, including high breaking strength. And in terms of functional and aesthetic properties, our 100% handmade Signature teapot leaves nothing to wish for, either. The SiamTeas Signature Yixing Teapot – unglazed 200ml teapot in the classic Chinese Yixing style. The teapot is made of a fine yellow clay, particularly rich in iron, which gives it some particularly desirable properties, including high breaking strength. And in terms of functional and aesthetic properties, our 100% handmade Signature teapot leaves nothing to wish for, either. Our SiamTeas Signature Yuzamashi is based on the Japanese-style side-handle style and the classic shape of Japanese cooling vessels. 100% handmade by a specialized pottery master from particularly iron-rich, rather coarse-grained red clay for best functional characteristics: high breaking strength, optimal cooling effect and completely drip-free. For further information and illustrations, please see the product description below.For more information and illustration, please refer to the detailed product description below. Our SiamTeas Signature Yuzamashi is based on the Japanese-style side-handle style and the classic shape of Japanese cooling vessels. 100% handmade by a specialized pottery master from particularly iron-rich, rather fine-grained yellow clay for best functional characteristics: high breaking strength, optimal cooling effect and completely drip-free. © 2019 Siam Tea Shop. Powered by PrimaShop (WC) and WordPress.